One Sunday morning, I travelled with my easel, hat and painting materials to Chorin. The day before, a barley field with its poppy flower splendour had appealed it to me. My day of painting was great, because I remained undisturbed and could enjoy the idyll the sunny, but not too sunny Sunday in solitude. Far and wide there were no people, only swooshing, rustling, buzzing and humming, a light breeze – cooling and pleasant. It was beautiful here! I felt completely relaxed, even a bit idle, allowed myself leisure and time for every brushstroke. Eventually I looked at the clock and received a shock: 6pm already, time to stop. I regarded my picture, with its background finished and with only a few poppy flowers and hints of cornstalks and was completely perplexed. No, I couldn’t finish it today, even with the best will in the world and it would be impossible to finish it the next day. It was going to rain on Tuesday – what to do? Paint the white patches green with a thick brush? There a car stopped on the street and shortly after a woman with a camera walked over the field. 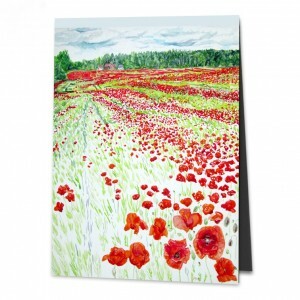 She took a few photos of the poppy field in the evening sunlight and finally also came over to me at the easel. She explained to me that she had been travelling by car for six weeks now across Germany, and that her final destination was the island of Usedom. ‘You won’t come across any more sunlight today,’ I said. ‘And I don’t have to,’ she answered in her friendly way. ‘I’ll sleep somewhere.’ – ‘At a B&B?’ I enquired. ‘No,’ she countered and laughed mischievously, ‘Just here under a tree somewhere.’ I looked at her incredulously. ‘Really? You, all alone?’ – ‘Yes, I’ve been doing it for years.’ I was really amazed. ‘Aren’t you ever scared?’ – ‘You’re kidding me!’ she answered, ‘What’s going to happen? It’s beautiful to sleep under a tree!’ I noticed her libertine spirit and her independence. A strong woman. ‘Your picture,’ she said, ‘is wonderful by the way.’ – ‘It’s not finished yet.’ – ‘But why not?’ – ‘The foreground’s still patchy.’ – ‘Really? I think it’s perfect.’ ‘Not a brushstroke more?’ – ‘Not a single one!’ - ‘Ok, well that’s that then.’ I painted my initials at the bottom right hand side, snapped my paint block shut and together we stomped, chattering, over the field back to the street.